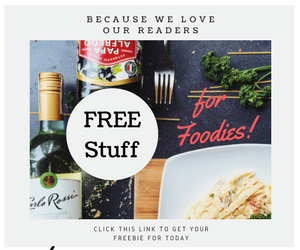 Did you know that plain popcorn has already been hailed as a great diet food for its low calorie content and that a group of scientists claim it may even top fruits and vegetables in antioxidant levels. The scientists from the University of Scranton in Pennsylvania discovered that one serving of popcorn has up to 300mg of antioxidants - nearly double the 160mg for all fruits per serving. Yaiks! And the highest concentration of these antioxidants, together with fiber, are found in the crunchy hulls of the popcorn. Well here is a better one! Last Monday I was able to meet one interesting and inspiring lady, and beautiful at that, who happens to have created magic in the usual movie and home snack. Thanks to innovation and resources from friends and business colleagues, she was able to come up with a better process in making the best popcorn so far. 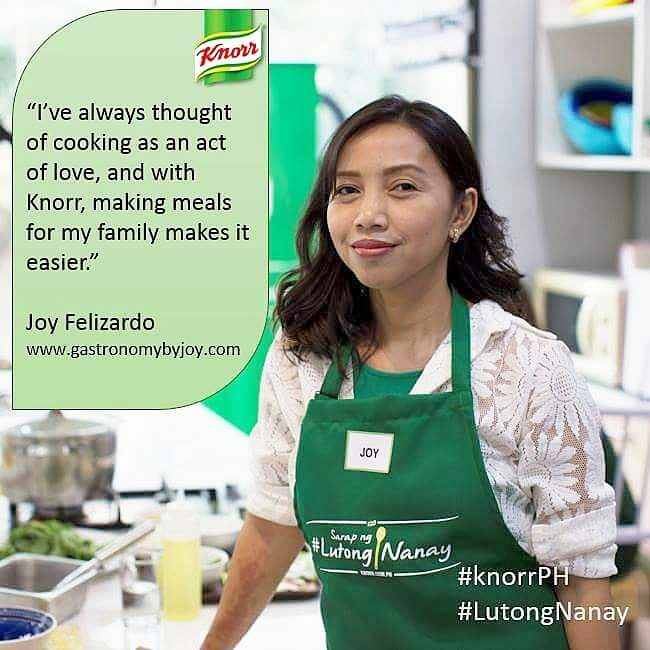 This only proves that though you don't have the deserving cooking or baking skills, you can still come up with a good food product, if your heart is into it and your dream big enough. "I'm not a good cook or baker, but when it comes to handling business I can say I am proficient," as Dee conveyed. This is her first try in the food industry and for a starting player she seemed to be well-accepted and hand-picked even by the biggest retail merchant, SM Supermarket. Deedee Ledonio is indeed a visionary, and an expert when it comes to handling her businesses. Currently a share-holder of Coltrans Cargo Philippines, she started in the business arena right after college at 19 years old with a degree in Bachelor of Science major in Economics which she took at University of Santo Tomas and a Masters Degree in Entrepreneurship at AIMS. Well, she wouldn't be awarded by her Alma Mater as the Most Outstanding Alumni for nothing. With that, it only goes to say that she always wants the best, thus, she made sure that what she would sell would not only appeal to her but to many. According to Dee, popcorn is a universal snack, and I couldn't agree more. But she doesn't like the mess that was left on her hands, nor the hulls that get in between teeth. What she wanted is a popcorn which you can eat anytime and anywhere without the hassles mentioned. But she wanted more. With the help of a food tech, they studied various processes of making the popcorn, from popping to the texture to flavoring. And Dee's Gourmet Popcorn came upon. 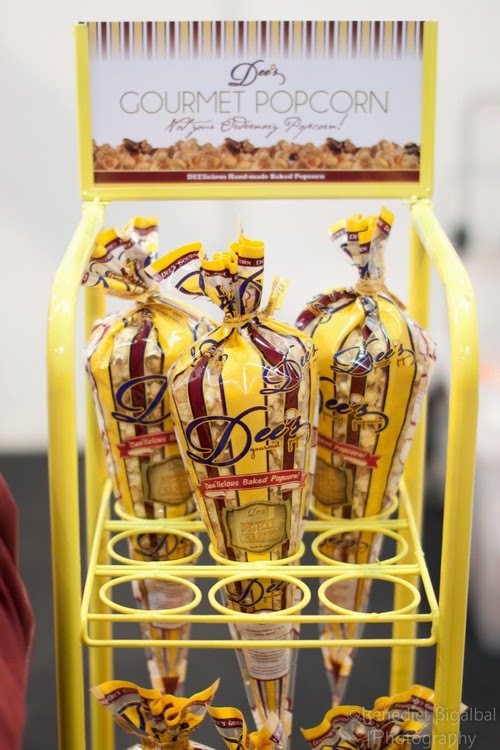 What makes Dee's Gourmet Popcorn more delectable? 1. All great popcorn comes from a good kernel. In popcorn jargon, a popped kernel of corn is known as a "flake". Two shapes of flakes are commercially important. "Butterfly" flakes are irregular in shape and have a number of protruding "wings". This type is what was normally used. "Mushroom" flakes are largely ball-shaped, with few wings. Mushroom flakes are less fragile than butterfly flakes and are therefore often used for packaged popcorn or confectionery. This is Dee's choice of kernels. 3. Since Dee's is a gourmet popcorn, it has to be unique, so aside from it's ball shape, it's coated with caramel, while still making it crunchy. Consider this popcorn a blank slate for other flavorings and extras. 4. 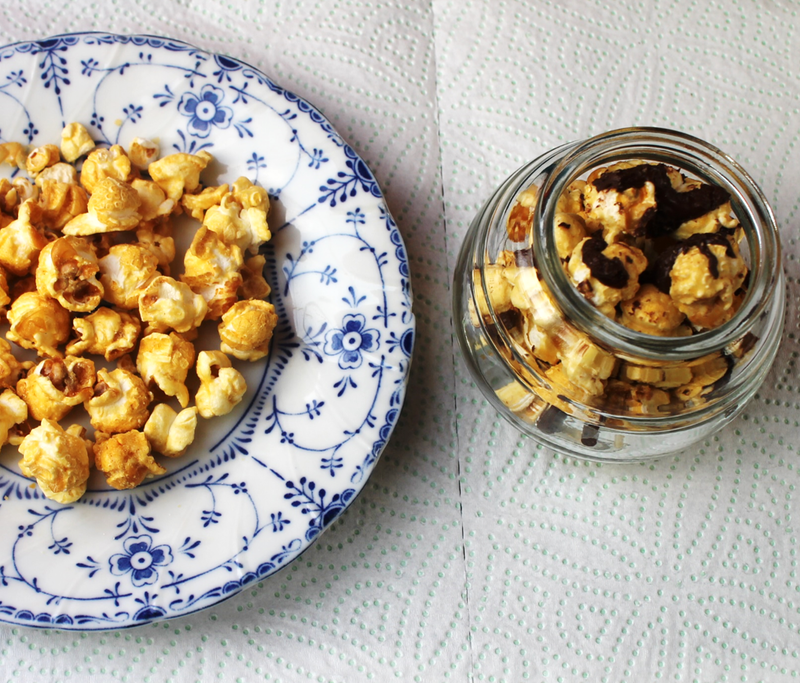 Making crunchy caramel popcorn is a two step process. First you make a simple caramel sauce on the stove top by boiling butter and brown sugar for a few minutes. Then you coat the popcorn with caramel sauce and bake it in the oven until dry and crispy. 5. I was lucky enough to have visited their commissary. I found several packs of coffee, nuts, butter and whatnot, on one of the shelves, I thought they were using customized powdered flavorings to enhance the popcorn, however, it was stressed that they actually use real ingredients, making it hand-crafted. And you will definitely taste the difference as you won't sense any after-taste that usual preservatives give. 6. 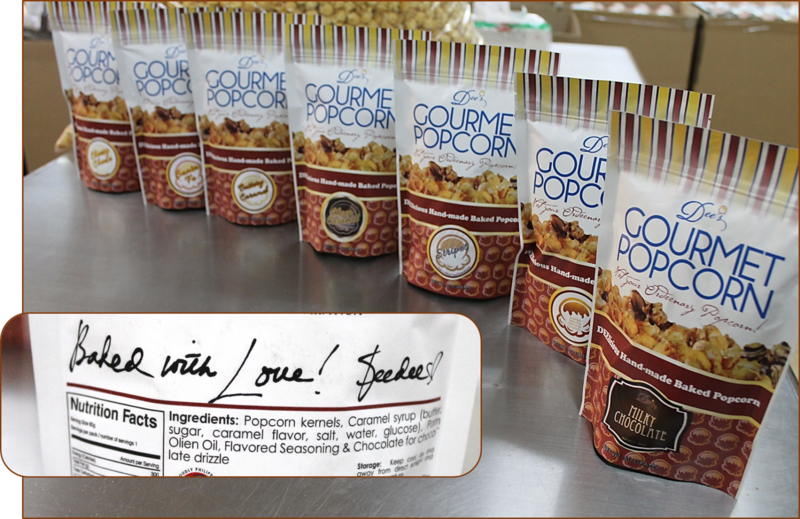 Consider the process: Air-popped - coated with caramel - baked - flavored - packaged - sealed = DEElicious Hand-made Baked Popcorn. However, if you want a sustainable business, there are matters and obstacles one has to overcome. Deedee, had to change her packaging to be able to capture the market while preserving her popcorn. They used to have the popcorn packed in clear cone-shaped plastics. They noticed that after awhile, the plastics get cloudy and thus became less appealing. One good business take-away from the finest entrepreneur such as Deedee, "It's all about the packaging!" For your product to survive in the market, you have to make sure it's attractive and colorful enough. If you dream to see your product in grocery store shelves, it has to compete with the looks of other products. Thus, she was compelled to change her packaging, from clear plastic, the new packaging is made from aluminum foil bag with printed paper finishing on the outside. What's best with the packaging is that it's resealable, having the zip-lock feature on top. So if you can not finish one, you can reseal it and just put it aside and come back to it, and you will find the popcorn still crunchy. Dee's comes in only one size, 60 grams. The classic flavor, Buttery Caramel is only P 50, while other regular flavors are priced P 60. 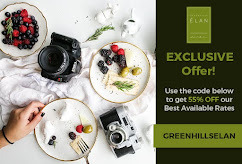 Premium flavors cost P 80. 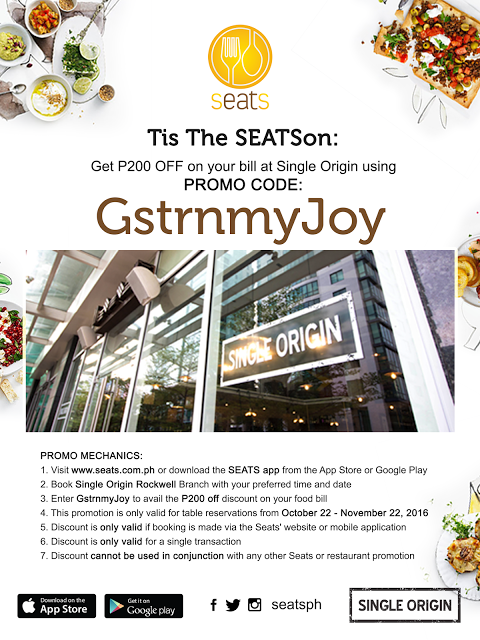 They are available in Robinsons Supermarkets (Ermita, Magnolia, Eastwood, Galleria), Metro Gaisano (Market Market, Ayala Alabang, Chinatown Binondo), Cash & Carry, Various bazaars, events and exhibits. This venue had everything a girl might need. I highly recommend their party planner. They lit the fireplaces and the views from the suite were exceptional.